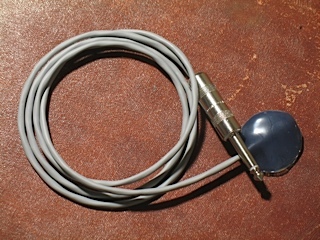 This is my version of the "classic style" contact microphone, mounted to 4 feet of slim instrument cable and terminated with a tough 1/4 inch guitar plug*. 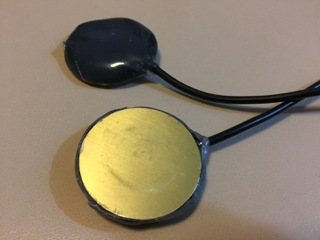 What separates this microphone from the other commercially available models is the reenforced piezo design: the piezo is a larger 3.5 cm disc and has a double layer of silicone, making it practically immune to short-circuiting. It's a fantastic all-around / all-purpose microphone. Whether you're at home in the studio or out there, on the road, the Classic Contact Microphone is ready to plug in and play! 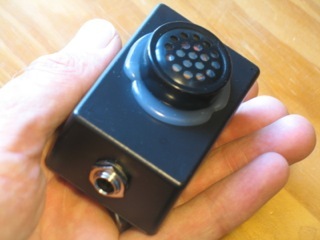 *The default input for this microphone is quarter inch, however, it can also be terminated to a mono 1/8 inch plug, which is useful for anyone working with modular synthesizers and portable recorders. If you prefer this type of input, please let me know. 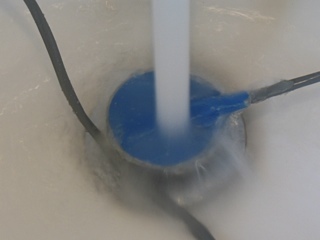 Want to submerge? Introducing the Immersion Sturgeon! 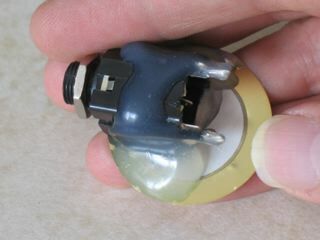 It's essentially my Classic Contact Microphone*, but with an extra added layer of silicone "skin" on the microphone component. 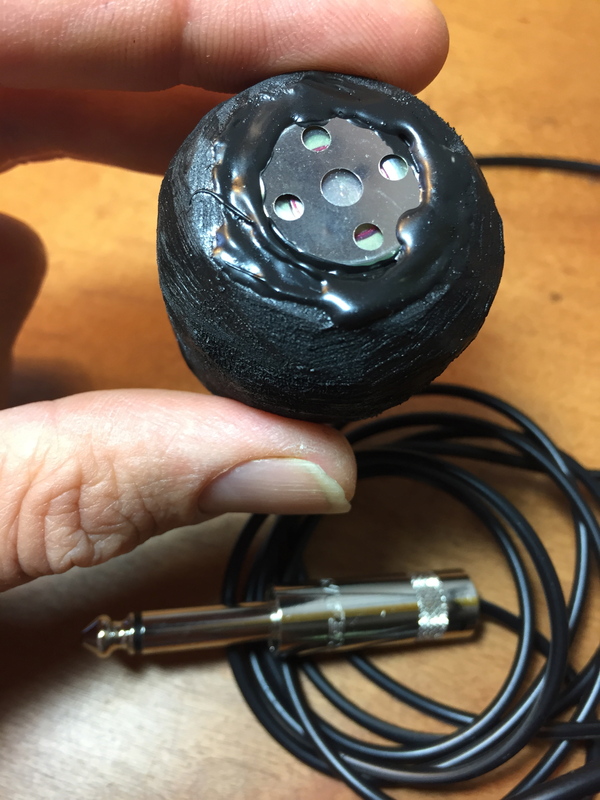 While not a true hydrophone (i.e., you won't hear any whales) the waterproofing allows the contact mic to be submerged, dragged through mud puddles, or served with mixed drinks (it sounds crazy-cool when dipped in club soda). The 4 foot cable provides enough wiggle room for aquatic experiments without getting your gear wet. 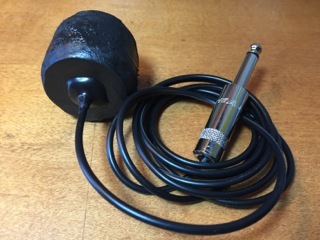 The Silo Jack Sperm Edition is one of my burliest contact microphones, well-suited for heavier scrubbing, aggravating shrub work, and feedback worship. 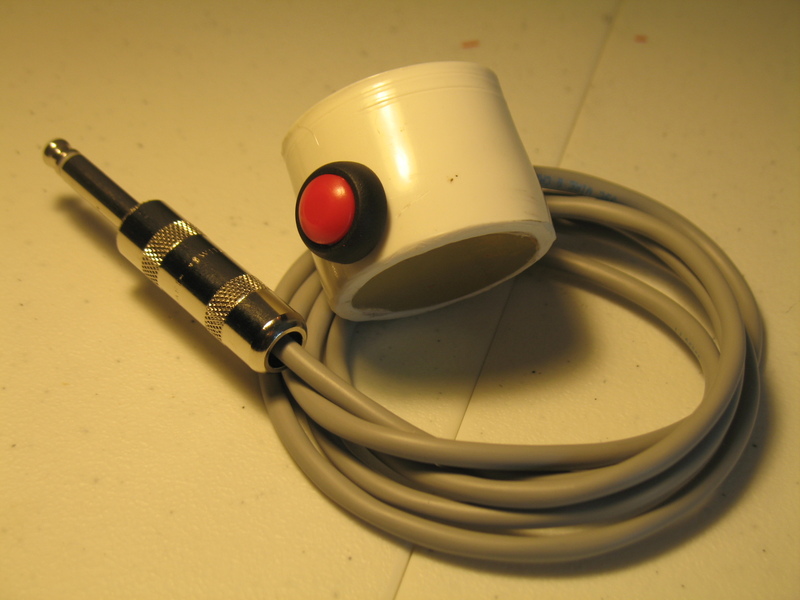 Here's the deal: the piezo element is fitted into a slice of PVC tubing and mounted solid with silicone. 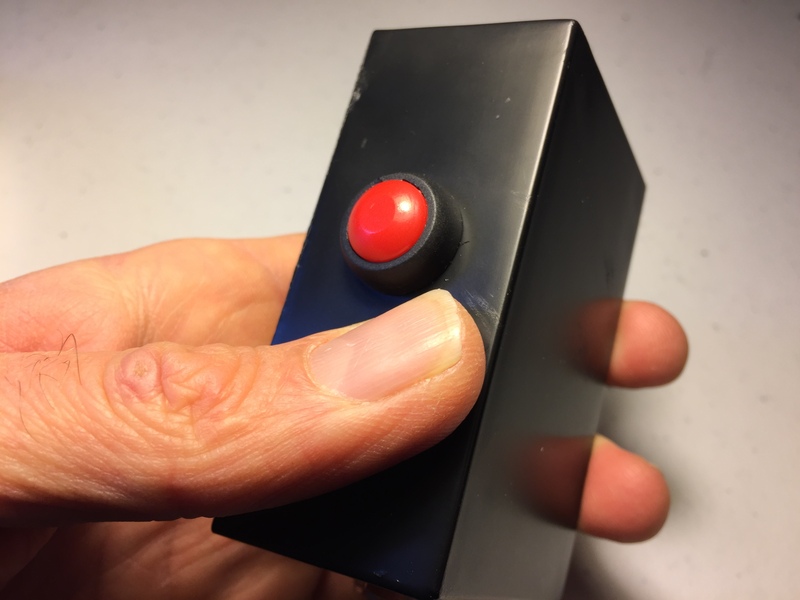 There's even a red-button kill switch if you want to get glitchy. On top of that, the SE is terminated to a four foot audio cable and 1/4 inch male guitar input*; it's ready to plug in and play. Hand built with love, sweat, and beers. 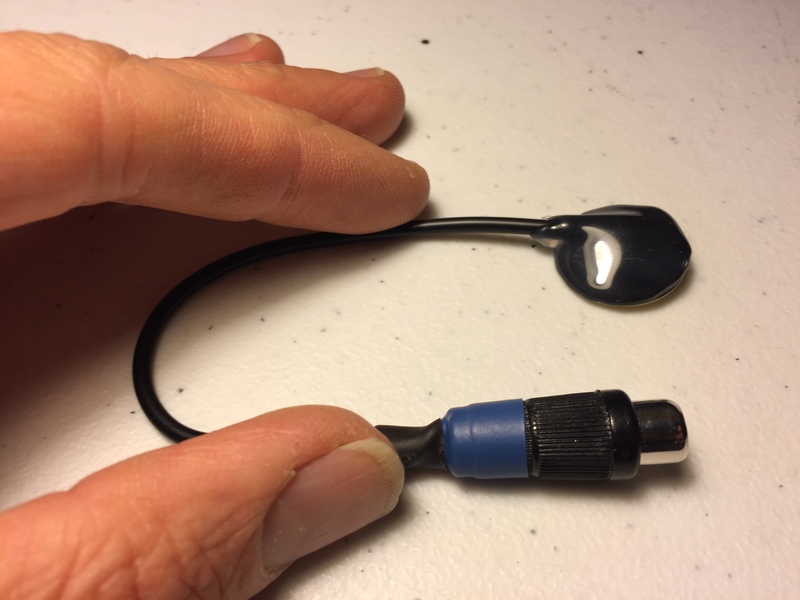 The Two-Timer Stereo Contact Microphone is designed with the field recording artist in mind. 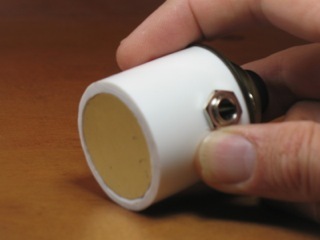 Nice and slim, the 2X'er features the same durable 3.5 cm brass piezo elements and is terminated to a stereo 1/8 inch plug. The cable spread runs approximately 4 feet per cable, giving a walloping 8 or so feet of stereo possibilities! It's perfect for portables -- minidisc, digital recorders, cassette recorders, you name it -- nearly anything that features a mini stereo input jack*. 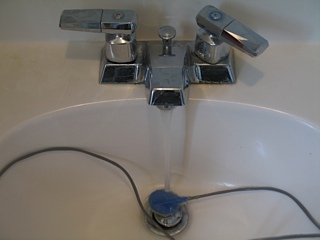 With a couple of adapters, the Two-Timer can also function as a cool stereo performance mic as well. 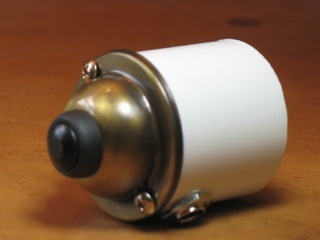 Works great in countless environments, plethora pantheon, and squeaking the old creaky table at home. Twice is nice, in this case. For a listen, here's the Two-Timer caught rustling around in our cabbage patch. Crazy kids! *I've done my darnedest to try this out on various portables, but as one can attest, not all recorders are created the same. As of this writing, the 2X'er works on my stereo Panasonic & Sony cassette recorders; Sony IC recorders; plus the ol' Zoom H2 (line-input) and Tascam DR-22WL. In theory, other models should follow suit but check your instruction manual first! 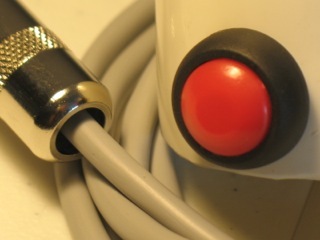 The Plug Ugly is terminated to a female 1/4 inch jack, allowing one to use any length guitar cable. Best of all, the PU is designed to withstand not only the demands of aggressive playing and performing, but also resists the daily wear-and-tear of being a klutz. 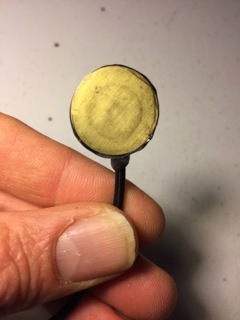 A hefty cake of silicone is fastened to the mic AND the jack, so that pressure and vibrations are absorbed throughout the body, and not the piezo element. 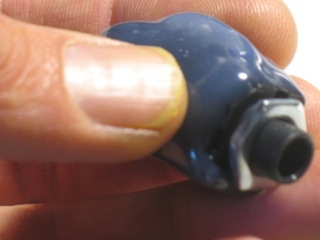 The result is a contact mic that is extremely durable. Highly recommended for percussive use, harsh noise abuse, and quite possibly elephant racing and dragging behind a Honda Civic. 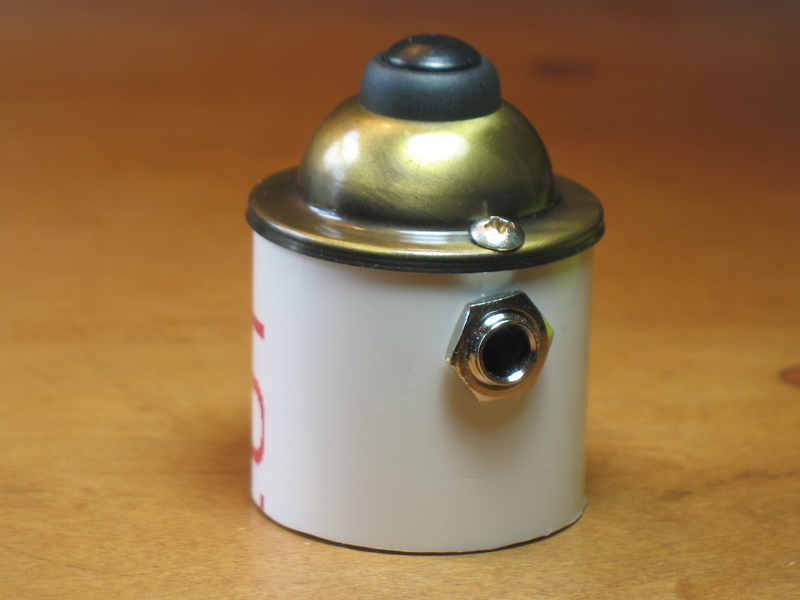 Thrills and spills be damned, the Odd Knob will knock your noises out of the park! 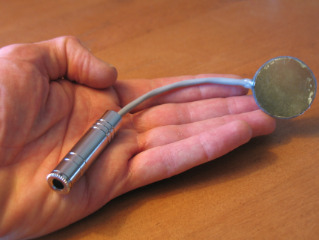 The Plug SP follows the same idea of the Plug Ugly -- terminated as a "jack-style" microphone, it can be used with any length 1/4 inch standard guitar cable. The SP features less silicone than its sibling, allowing for more delicate vibrations to be picked up. 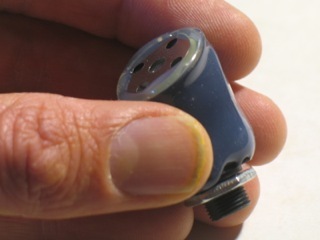 By no means fragile, the Plug SP features the same tough, made-to-spec piezo elements used in all my mics. 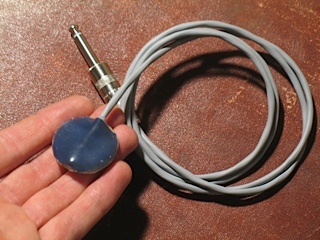 This contact mic is very well suited for electro-acoustic performance, general studio use, and field recording. The Codger Wand is basically a shorter version of my Classic Contact Microphone. 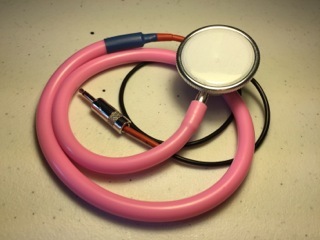 Terminated to a female 1/4 inch inline jack with approximately 6 inches of wiggle room, the Codger Wand can slip into those slim fitting jeans comfortably while giving you the option of adding your own cordage. This is one of my go-to microphones while on tour. The Depth Charge Gamelan is an electric maraca with a twist! Loaded with rattles, a spring wobbler, and topped off with a big red button kill-switch, this little unit blasts it up a notch by adding ricocheting reverb and on/off switching to all your trembling mayhem! The DCG works best with electronic FX, heavy gain, and (of course) stacks upon stacks of high volume. Accepts any length 1/4 inch cable (not included). 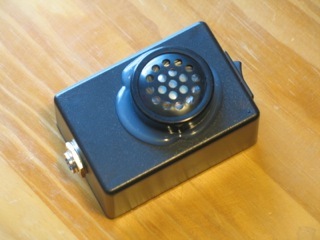 Click here for an audio clip of the DCG in action, plugged into a fuzz pedal! 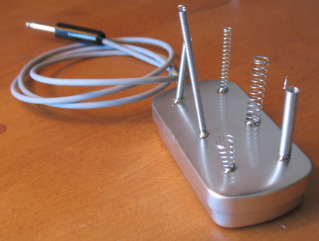 The Perpetual Spring Device is an instrument that consists of different sized steel springs mounted to a 4 inch x 2 inch tin (approximately the size of a breath mint tin). 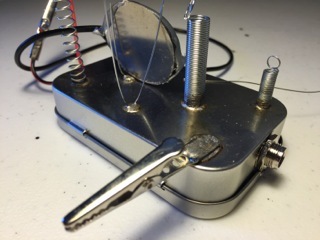 Mounted with a contact microphone and terminated to a four foot cable, you can plug it in* and pluck the springs, attack it with a violin bow, or add your favorite noise FX. 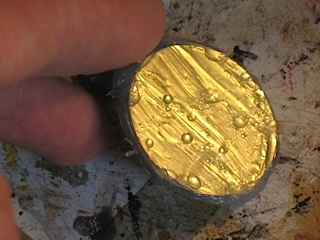 - A variety of compression & tension springs welded on top of the tin. - Several additional extra wires & a guitar string (or two); great for bowing, plucking, etc. - A side-mounted alligator clip, splendid for grabbing onto extra goodies, gadgets or vibrational devices. 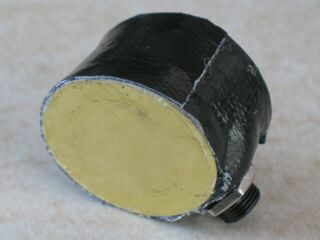 One 3.5 cm piezo element is housed inside the tin. 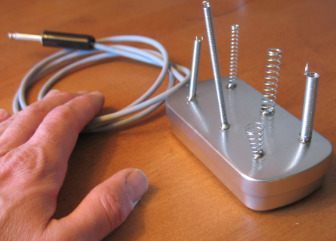 The second 3.5 cm piezo element is attached to the outside of the tin, by way of a thin black cable. 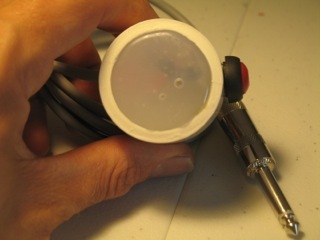 The mic is activated by connecting a set of external wires (see the photos). 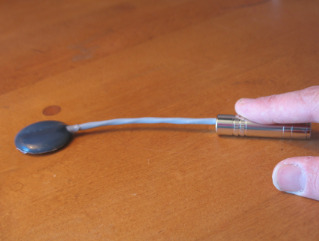 This allows one to use both the in-house piezo and external contact microphone simultaneously! 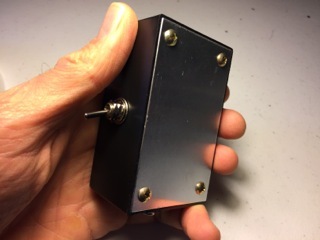 So, whether one is into electroacoustic music, pocket-sized experimental percussion, or in search of total blissed-out, never-ending wobbly reverb, the Multi-Plunk will deliver! The Plank & Pluck is yet another hybrid of the Perpetual Spring Device. 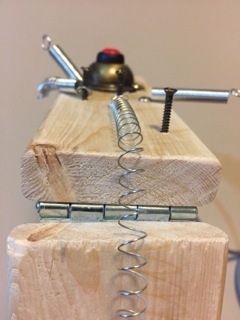 A handful of springs are bolted, mounted, and stretched across two small wooden slabs, joined by a door hinge. 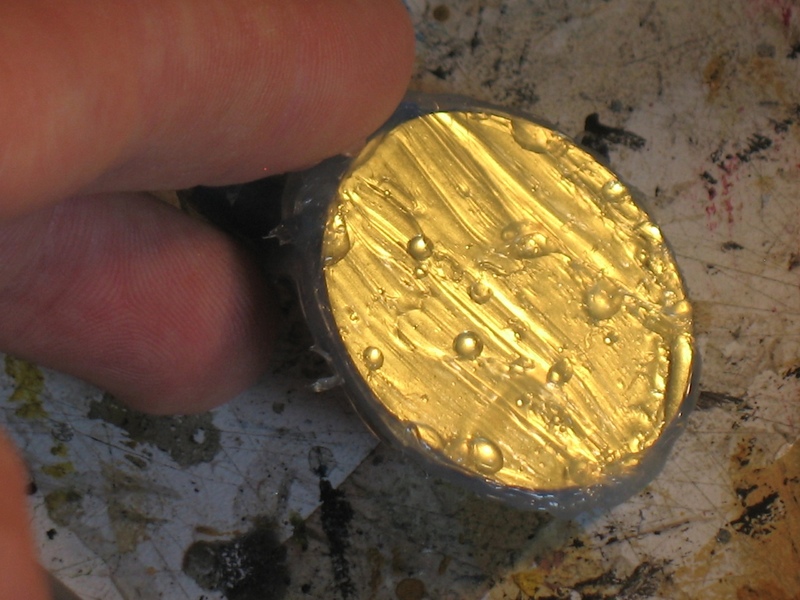 On their own, the springs resonate and shimmer when plucked, smacked, or bowed like a violin. 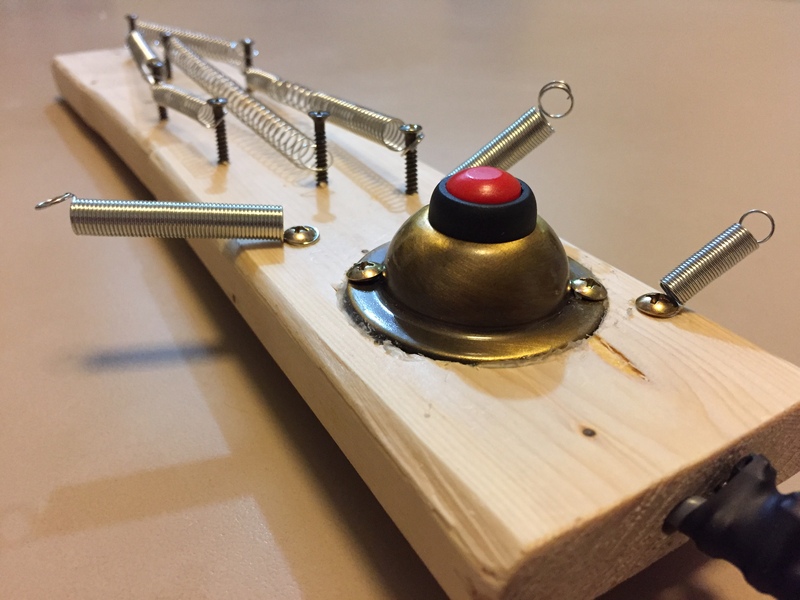 Using the door hinge, the springs take on unusual metallic tones and timbres; plus, the hinge creaks and squeaks as well! 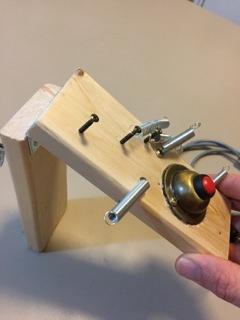 Imagine the P & P as a mini-foley device: with its groaning hinge, reverberating springs, and red-button kill switch, it's a powerful addition to one's sonic noise set up and also a cool instrument when played clean and direct into an amplifier. 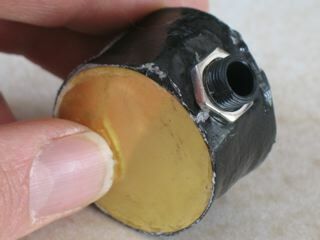 The Plank & Pluck is terminated to a 1/4 inch guitar plug* with approximately four feet of cable. The instrument's dimensions measure roughly 12 x 3 inches when extended. Please note that measurements will vary somewhat, as each instrument is unique! 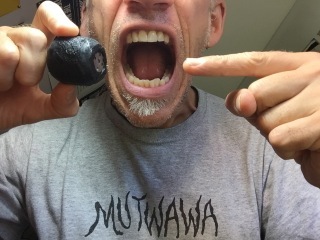 The Town & Mouth Report is not a contact mic, but my version of a vocal mic. 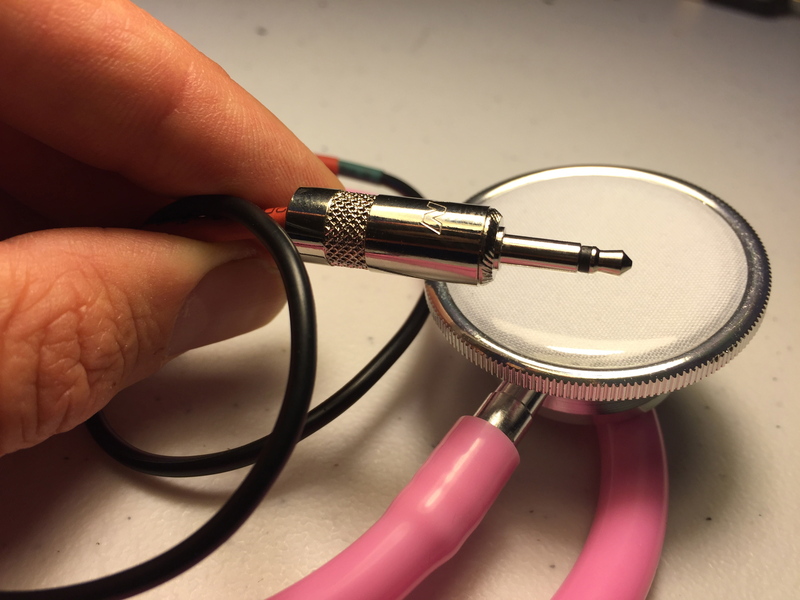 By affixing a small transducer / speaker to a 1/4 inch female jack, the T & M transforms into a wonderful verbalizing-device, capable of supplying countless hours of vocal chord workouts & mouth sounds. Plug it into big nasty FX for uber-vox, run it clean to sound like a lo-fi circus barker, OR take it from an output to use it as a micro speaker. The Barky Box Largemouth Edition is a variation of the Town & Mouth Report vocal microphone. Housed in a black ABS project box, the Largemouth features a wide dynamic mic component, making it perfect for crooning and swooning crowds of doting fans. 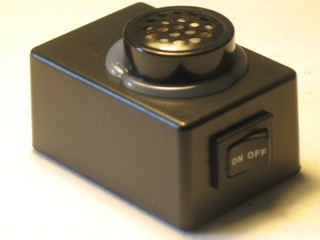 Additionally, there's a snazzy on/off switch, allowing one to release their vocal torrents with equal parts delirium and discretion. Use it with heavy FX to create glitchy cut-up verbal walls, or run it clean through a cheap guitar amp to get a circus-barker effect. Sing, slobber, and scream: the Barky Box can handle it! 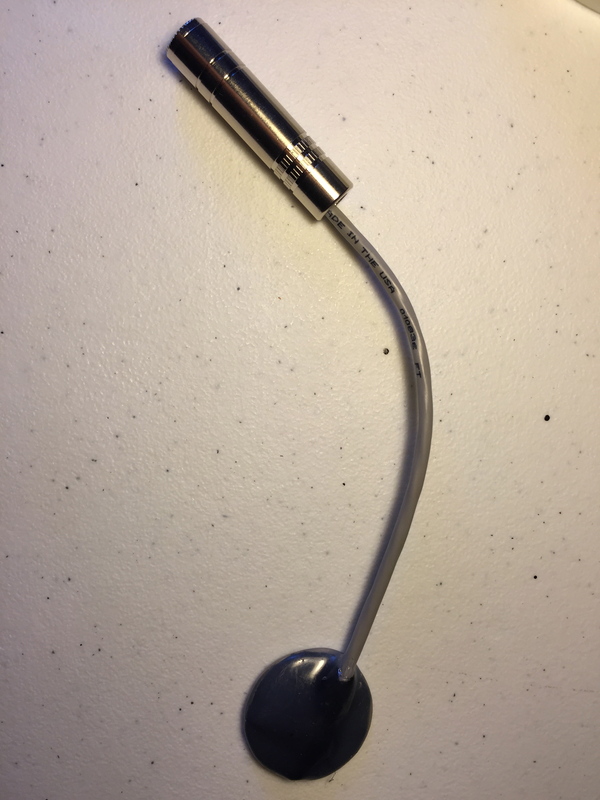 This microphone measures approximately 2.5 inches by 1.5 inches (6.35 cm by 3.81 cm), and is roughly 1 inch (2.54 cm) deep; it will fit nicely into the palm of your hand. 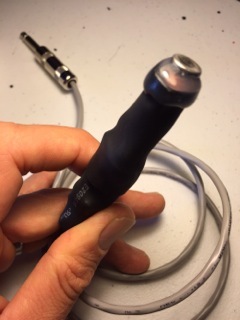 The Barky is terminated to a standard 1/4 inch female jack (cable not included). The Crank & Barrel is a cool little nugget that fits in your paws and lets you holler like none other. 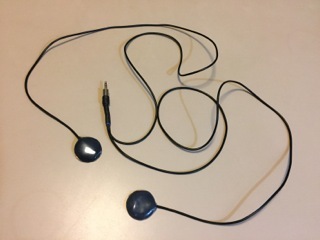 Using the same component featured in the Town & Mouth Report microphone, the C & B is housed in a sturdy, wood shell and comes equipped with approximately 4 feet of wriggly tail, terminated to a quarter inch input*. Plug it into your favorite FX rig, use it as a harmonica mic, or practice your favorite yodeling jams. The Codger Jr. is a spin off of my Codger Wand Contact Microphone. 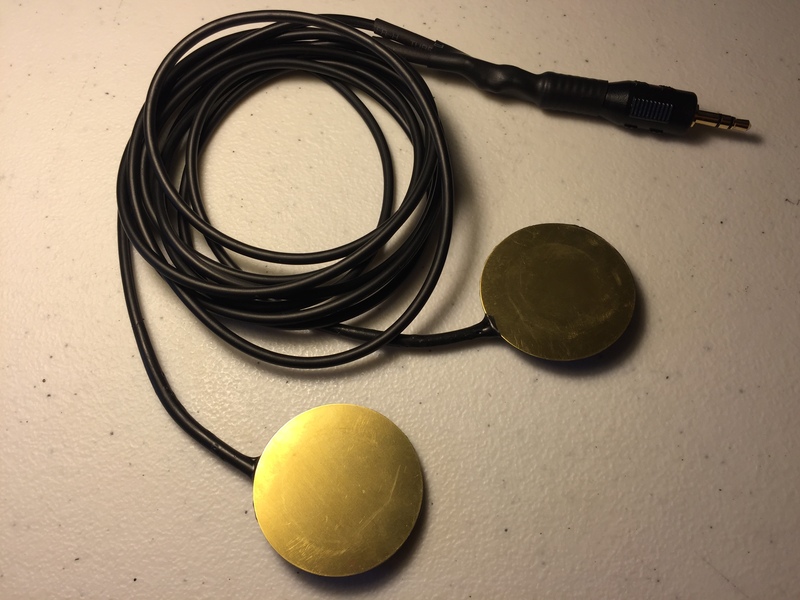 Featuring a smaller diameter brass piezo element (.75 inches) and measuring roughly 7 inches nose to tail, this junior model is not diminutive in sound -- its smaller disc rivals both the "boominess" and sensitivity of my other larger piezos! What sets the CJr. 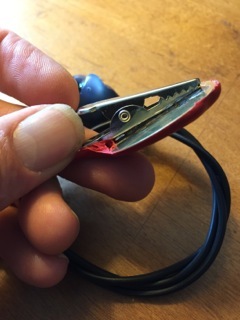 apart is size: the near-weightlessness allows it to go places where heavier gauge cables simply will not, making it perfect for audio installations, amplifying fragile objects like balloons, or affixing to smaller musical instruments (mandolins and the like). 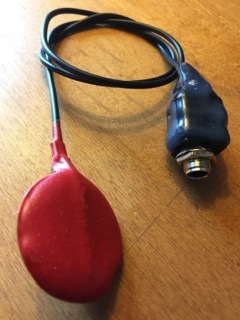 A little heads up: in order to keep it lightweight, the Codger Jr. is terminated to a standard female RCA jack. 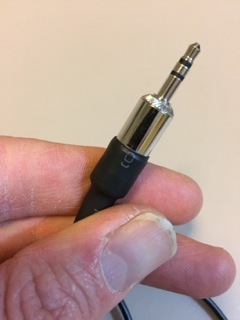 An audio adapter is included (RCA to female 1/4 inch). 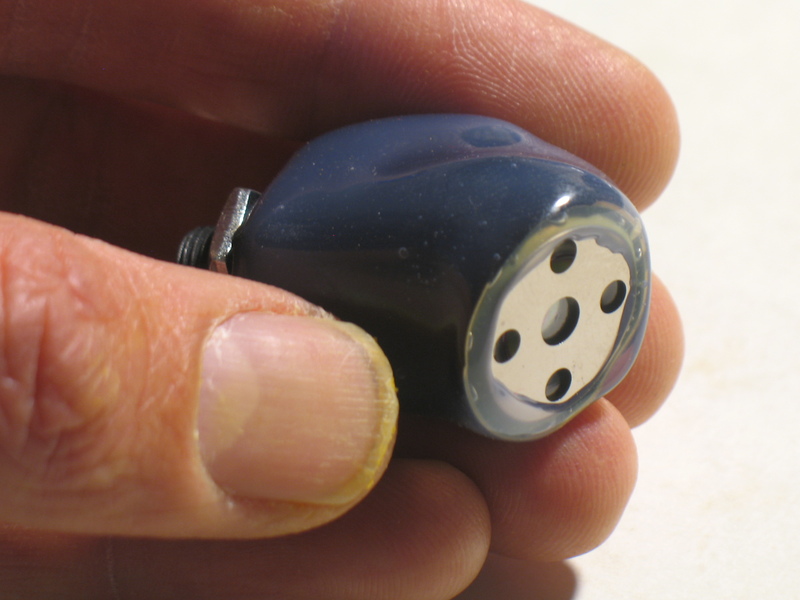 The Tiny Bite Contact Microphone possesses the teeth to grab on to anything! Equipped with an alligator clip, this mic can bite into slinkies, guitar strings, and other exciting bits of electro-acoustic detritus, amplifying their sounds to your heart's content. The Tiny Bite comes with 4 feet of slimline cable and is terminated to a female 1/4 inch jack, allowing you to extend the reach of its mandibles by providing any length cable. 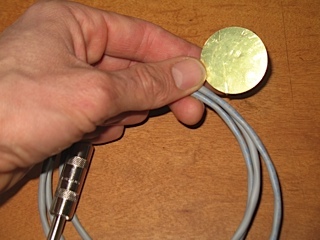 *The default input for this microphone is quarter inch jack, however, it can also be terminated to a mono 1/8 inch plug, which is useful for anyone working with modular synthesizers and portable recorders. If you prefer this type of input, please let me know. The CroMagnet is my version of an old-timey electromagnetic pickup. 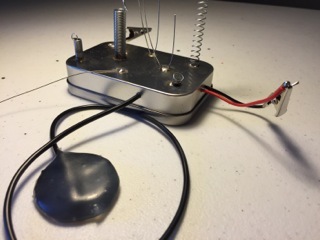 What differentiates this from the other microphones is the component itself: in lieu of a piezo transducer element, this pickup is constructed with an iron core, wound with a copper coil. 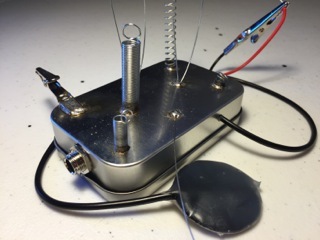 The result is similar to a guitar pickup; anything that is magnetic becomes amplified. Terminated with approximately four feet of cable and a 1/4 inch guitar plug*, the CroMagnet pickup is wrapped in tough heat shrink. This pickup is designed for the experimental artist. 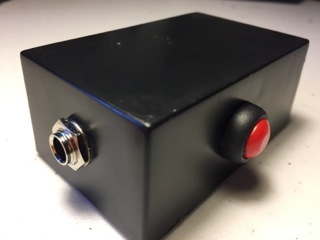 It's a lofi device: maybe a tad buzzy (although not as bad as a single coil guitar pickup); it also might need a little gain/trim adjustment on your mixer. That said, the CroMagnet is a splendid workhorse and responds well when amplifying motors, bits of metal, fluorescent lamps, speakers (including telephone speakers), as well as ebows and electric toothbrushes! It comes with an extra magnet to play around with. 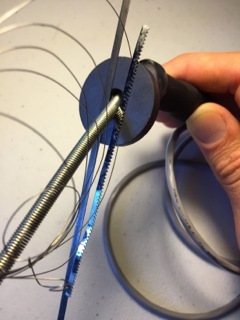 Here's an audio sample using springs, a magnet, and an ebow. Every so often a custom request gets realized and turns into a popular item. 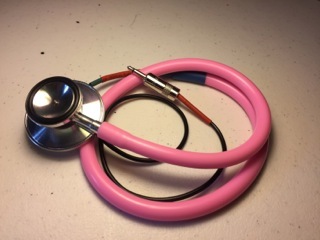 This is case with the Husoscope; it's a cool, lofi microphone, featuring a stethoscope head, roughly a yard's worth of wiggle room, and a mono 1/8 inch mini plug. The Husoscope is terminated to a tiny electret style microphone element (located inside the tubing), and works well in combination with microcassette recorders, portable cassette recorders (Walkman-style, not shoebox), certain digital dictaphones, and even on Euroracks (equipped with a 1u module). 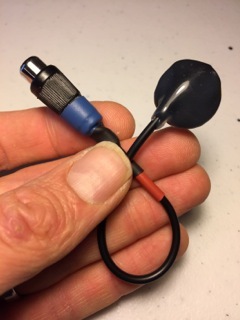 Please keep in mind that electret microphones require a tiny bit of voltage in order to work* (see below), and while a lot of "old school" recorders feature this with their mini-jack inputs, not every model does. Nevertheless, I've had pretty good results with a variety of recorders, as well as this clip (recorded on a digital Sony recorder). *As is the case with all electret style microphones, simply plugging this into a standard mixer or adding phantom power boost will not work. I've also experienced letdowns trying to get this to function with certain older digital recorders such as my portable Zoom or the similar-sized Tascam. 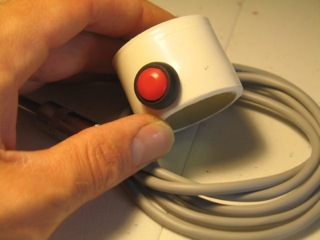 Instead, look for recorders featuring 1/8 inch mic inputs that read "Plug-in Power". 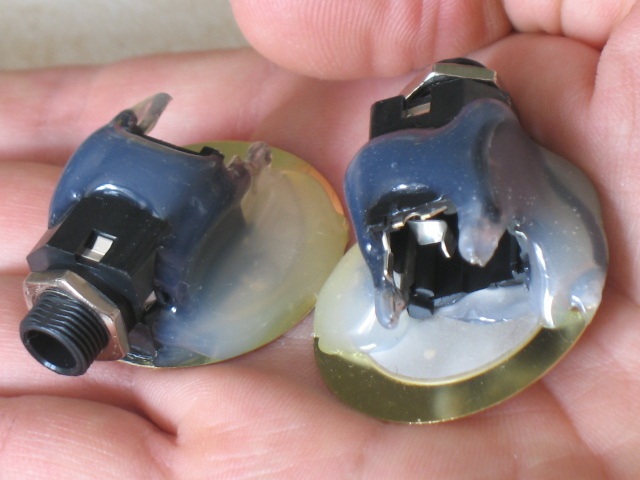 These have the voltage preamp built in, and will easily run the Husoscope. Please feel free to contact me with any questions on models and brands; I'm happy to share the knowledge. 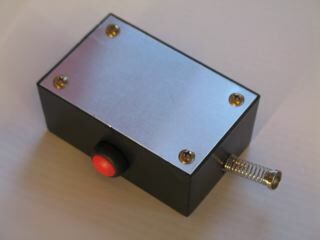 The Switch & Bait is a simple 2-to-1 switch box, redirecting two audio sources to one output with the flick of a switch. 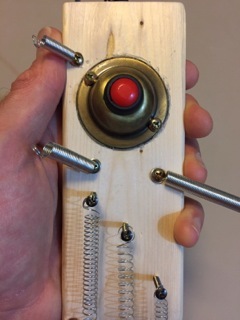 In addition to the toggle switch, I've added a momentary kill switch (that's the red button in the photos), which allows one to temporarily cut the audio signal to the output. Housed in a 3 x 2 x 1.5 inch plastic project box, it should be pointed out that the Switch & Bait is a passive switcher -- it does not require a battery or AC to work -- and as such, will not add gain or signal boost. 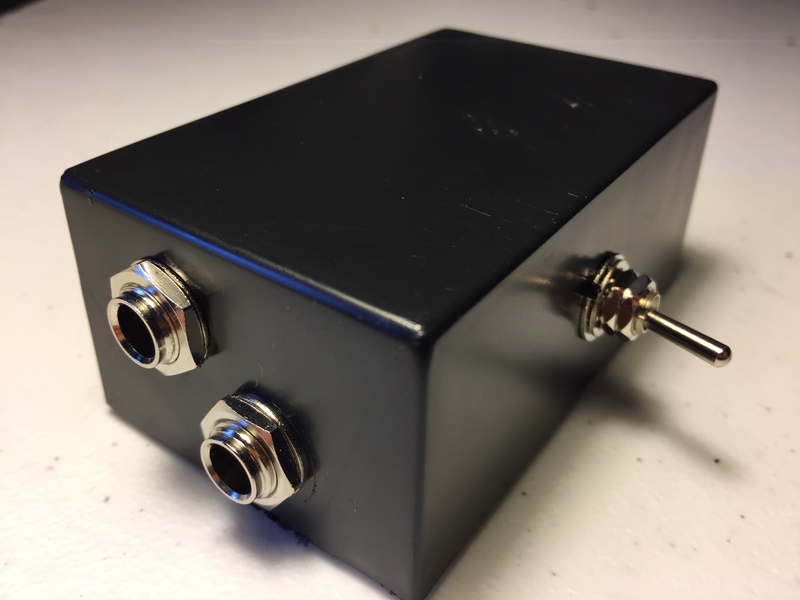 Terminated with 1/4 inch female jacks, the box can be used in any duo-combination: pairing up microphones, tape players, FX, you name it. Click on this track to hear two S & B boxes in action. The sound sources came from four cassettes of kicking aorund the studio. I just let the tapes roll and the switches do the talking! Cables, tape recorders, or head-rubs not included. Yep, gift certificates are a must for the noisemaker in your life! These gift certificates are good for one year (give or take), and can be used to purchase any item in our Etsy shop or on this website. Postage is INCLUDED with orders using a gift certificate. 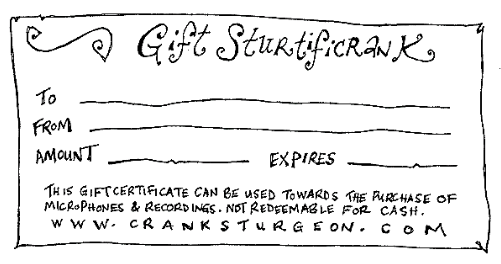 Gift certificates are not redeemable for cash, and are only available in the USA. There's even more at our Etsy store!